“We would consider this a relatively small dose of training, a low intensity intervention. The persistence — the durability of the effect was impressive,” said Dr. Unverzagt, who explains more in a Q&A blog post. Results from the Advanced Cognitive Training in Vital Elderly — ACTIVE — study of 2,802 older adults were recently reported in Alzheimer & Dementia Translational Research and Clinical Interventions, a peer-reviewed journal of the Alzheimer’s Association. Participants who received computer-based speed of processing exercises — exercises designed to increase the amount and complexity of information they could process quickly. Initial training consisted of 10 sessions lasting about an hour, over a period of five to six weeks. A subset of participants who completed least 80 percent of the first round of training sessions were eligible to receive booster training, which consisted of four 60 to 75-minute sessions 11 months and 35 months following the initial training. Participants were assessed immediately after training and at one, two, three, five and 10 years after training. After attrition due to death and other factors, 1,220 participants completed the 10-year follow-up assessment. During that time, 260 participants developed dementia. The risk of developing dementia was 29 percent lower for participants in speed of processing training than for those who were in the control group, a statistically significant difference. Moreover, the benefits of the training were stronger for those who underwent booster training. While the memory and reasoning training also showed benefits for reducing dementia risk, the results were not statistically significant. Dr. Unverzagt noted that the speed of processing training used computerized “adaptive training” software with touch screens. Participants were asked to identify objects in the center of the screen, while also identifying the location of briefly appearing objects in the periphery. The software would adjust the speed and difficulty of the exercises based on how well participants performed. Earlier studies had shown that ACTIVE cognitive training improved participants’ cognitive abilities and the ease of engaging in activities of daily living five and 10 years after the initial training. However, an examination of the role of ACTIVE cognitive training on dementia incidence was not significant after five years of follow-up. 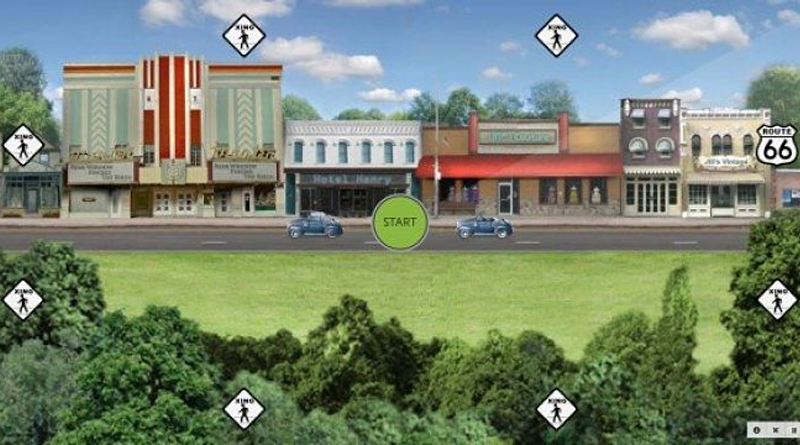 November 16, 2017 – Photo Credit: Posit Science; The current version of the “speed training” software, now called Double Decision and produced by the company Posit Science. Source: Materials provided by Indiana University. Note: Content may be edited for style and length.